Place to Place (Atchi Kotchi, or Acchi Kocchi) is a Japanese yonkoma manga series by Ishiki which began serialisation in Houbunsha's Manga Time Kirara magazine from 2006. 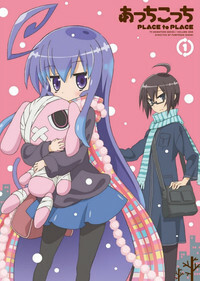 An anime adaptation by AIC aired on TBS between April 5, 2012 and June 28, 2012. The opening theme is Atchi de Kotchi de ("Here and There") by Rumi Ōkubo, Nobuhiko Okamoto, Hitomi Nabatame, Kaori Fukuhara, and Shintarō Asanuma, whilst the ending theme is Te o Gyu Shite ne ("Squeeze My Hand Tight") by Rumi Ōkubo.